We’re glad to welcome a new guest blogger at the Scratch Pad! The Itinerant Golfer profiles Steve’s quest to play all of the top 100 golf courses in America. You’ll get a chance to see a round in action, along with great photos of the holes on the course. We’re glad to have him with us, and will be sharing some of his best posts with you. I wasn’t quite sure what to expect as I headed to Wisconsin to play Whistling Straits. Despite its high ranking of #22 on the Top 100 list, I wasn’t overly excited to play it. From what I could tell about the course from my research on the internet and from watching events played there on TV it was probably not going to be my kind of course. I was hoping to be surprised. Once I got outside of Milwaukee I was in rural Wisconsin and was thankful for my trusty GPS unit. Eventually I saw the Whistling Straits sign and turned into the driveway. As I wound my way around I was very pleasantly surprised to see that there was no colossal clubhouse or hotel. Instead it was just a modest little clubhouse built to look like an Irish Cottage. Whistling Straits Golf Course was designed to have the feel of an authentic Irish golf club. I’m feeling better about this already. The photo below (which I did not take) shows a great view of the clubhouse. Disclaimer – Do you get tired easily if you walk 18 holes? If yes, this post is not for you. 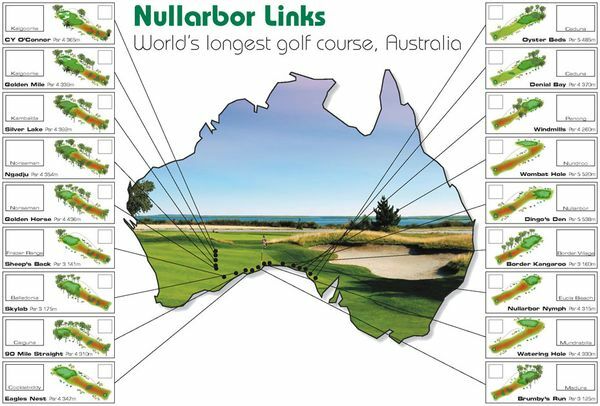 The Nullarbor Links golf course in Western Australia’s Golden Outback is long enough to wear out a new pair of shoes. This unique 18-hole, par 72 golf course stretches 848 miles and is undoubtedly the World’s longest golf course. Walking obviously isn’t an option here and neither are golf carts! Players need to bring their automobile and drive to the next hole since the average distance between holes are 66 kms (in fact two of the holes are 200 km apart). The course, dreamed up over ‘a couple of beers’ and five years of effort was developed to enhance tourism along the highway, providing travelers with a most unusual added attraction. Each hole showcases a local attraction, including ancient fossil beds, a giant kangaroo statue, whale-watching and more. In addition camels, kangaroos and wombats give players the company but you will have watch out for the crows – they have a habit of stealing balls (around 200 balls had been lost so far). The course takes three to four days to complete and at the end each golfer is awarded with a certificate of completion. Playing the Nullarbor is a real test of determination and patience, but is also an experience you might never forget. Angela Park is not a household name, but she has a beautiful swing. Hailing from Brazil, Angela Park is in her fourth year on the LPGA tour. Has she ever won a tournament? Nope. Is she a household name? Nope. But does she have a beautiful swing? Yes indeed.. Spend a few minutes watching the video below, and you can’t help but be infected by the simplicity, the great rhythm and the superb form. Now go out on the range and hit some balls. And be amazed and what a little tempo and relaxed form will do for you.